I have one custom list on a Sharepoint 2013 site. 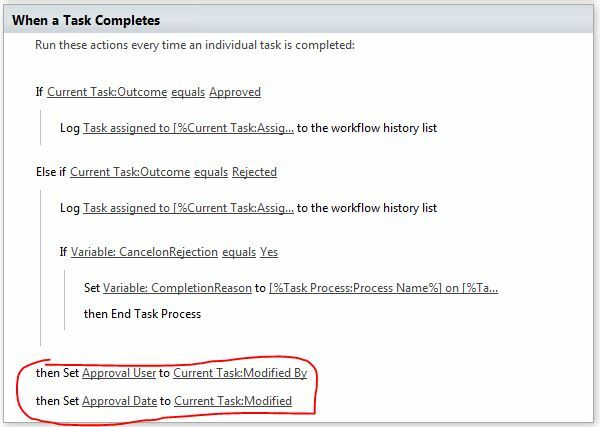 I'm using the OOTB default approval Workflow from Sharepoint 2010. Everytime a new record is created in this custom list the workflow is started and routed for approval to a group of people so that any of them can Accept or Reject the request. On my list view I can add the workflow status column from the "modify this view" menu to display the status, but I would like to also display the user who approved it or rejected it and the date it was approved. Is it possible to do it? If i check the workflow history I notice that information is already in there (user and date of approval) but I would like it printed as an additional column in my list view. You have to add an extra column for that and show it in the View/New View. Now once item is approved/Rejected by the user from the Approvers group, just Add the Display Name of the Approved/Rejected person in the new Custom column. (You can do the same for the date also). Hope this would help you! I solved it by creating a custom workflow. I stopped using the default approval workflow and created a new one and used the instruction start approval workflow as the only step. By using the default approval workflow I wasn't able to do the last step since the columns weren't available. I guess because it was the global workflow. And since I created a list workflow the columns were now available. Not the answer you're looking for? Browse other questions tagged workflow list-view column approval or ask your own question.